All dentists look. The best dentists listen. 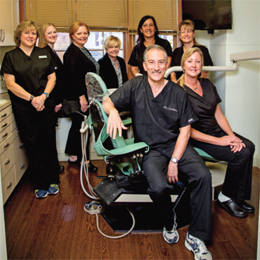 At Sattler Family & Cosmetic Dentistry, in Southampton, Robert H. Sattler, D.M.D., MAGD, is committed to patient satisfaction. After examining a patient’s teeth and gums with a dental mirror, Dr. Sattler’s next best instrument is his ears. “I listen a lot to the patient to best understand what they’re looking for from me,” Dr. Sattler says. “I want to help them achieve their perfect smile. After listening to the patient, I ask myself: Is what they want right for them? I think: If this is my family member, how would I treat them? I put that together with what a patient is looking for, and we discuss it. I begin by telling them what the best treatment option is. But if that’s not in their budget, we go through alternative treatment options. Since 1989, Sattler Family & Cosmetic Dentistry has been a comprehensive resource for individuals and their families when it comes to dental health for patients of all ages. Whether a patient yearns for a brighter smile or a brand new one by way of dental implants—or perhaps is considering porcelain veneers, cosmetic bonding, crown or bridge restoration, orthodontics or other advanced dental disciplines—Dr. Sattler pledges to meet each patient’s specific expectations. When a patient chooses Sattler Family & Cosmetic Dentistry, they can be confident that they’re in good hands. Dr. Sattler is among the more accomplished and acknowledged practitioners in his field. His compassion and dedication to provide comprehensive, state-of-the-art service to patients is unmatched. An honors graduate of Temple University’s Maurice H. Kornberg School of Dentistry, Dr. Sattler was selected for a general practice residency at Albert Einstein Medical Center in Philadelphia; these types of prestigious residencies are offered only to the top 10 percent of graduating students nationwide. Furthermore, he typically completes more than 100 hours of continuing education credits each year, far exceeding the state requirement of 15 hours annually. Dr. Sattler also holds the highest designation in the Academy of General Dentistry—a master level that requires advanced training in 16 disciplines of dentistry, including periodontics, orthodontics and implantology; a distinction that just 1 percent of dentists nationwide have earned. He most recently was selected as a fellow of the International Team for Implantology, a worldwide organization that numbers 1,700 U.S. members, but only 100 fellows. While Sattler Family & Cosmetic Dentistry offers an array of services, and treats patients as young as 3 and as old as 105, Dr. Sattler states that a great deal of his patients seek him out for implant dentistry. “Ten years ago, the buzzwords in dentistry were cosmetic dentistry and whitening,” Dr. Sattler says. “I think dentistry has changed over the years, and I like the opportunity to do a variety of procedures, not just one. When patients visit Sattler Family & Cosmetic Dentistry, they are met with a welcoming smile from a friendly, attentive staff that greets each visitor warmly by name. The reception area makes patients feel as though they’ve entered a friend’s living room, unlike a typical dental office that emanates a sterile, medicinal feel. Made an appointment for noon? Worried about being late to return to work? At Sattler Family & Cosmetic Dentistry, worry no more. Although Dr. Sattler is the only dentist on site, his experienced staff of expanded function dentists and two hygienists, who share his passion for warm and personal patient care, affords him the flexibility to care for more patients and on time. One aspect of Sattler Family & Cosmetic Dentistry that Dr. Sattler believes sets his practice apart from others is its commitment to staying attuned to his patients beyond the time they’re in his examining chair. Growing up in Michigan, Dr. Sattler set out to follow in his father’s footsteps and become a pharmacist. However, after graduating from pharmacy school, he quickly came to the realization that he wanted a career where he could apply his clinical knowledge. Next stop: dental school. And he hasn’t looked back since. “I get up every morning and look forward to going to work,” he says. His patients couldn’t be happier. Published (and copyrighted) in Suburban Life Magazine, January, 2017.